When students blog there is a global audience. The engagement piece has skyrocketed for my students. Boys that didn't want to write in my class are writing posts from home now. I show my students the cluster map on my blog and they are amazed how many people from all over the world have come to our classroom blog. We all like getting hits or comments on our blogs. It is the same for our students. Their faces beam when they see someone has commented on their blog. I make sure all students receive comments on their blogs. I will post a comment, classmates post comments, parents, other teachers and I have asked my PLN on Twitter on occasion to post on my students' blogs. Students' are not writing solely for their teacher or their class to read, they are writing for the world to see! Currently, my students are writing personal narratives on their blogs. They have added page numbers and I have corrected mistakes by putting "Editor" underneath their sentences and written the sentence correctly while conferencing with them. Mrs. Soltauheller's grade 2 class from British Columbia is doing the same thing. Our students have been buddied up and are commenting on each others' stories. We are working on asking questions to add details. One of my 6 year old student's in my class screamed the other day because she had 8 comments on one of her posts. If that isn't incentive to write, I don't know what is. I encourage you to leave a comment on Annalyse's blog here. I can't wait to be able to look back at their blogs in June and see all the progress they have made this year! In a society where the Internet and social media is anywhere and everywhere, children need to learn how to protect their identity, know what is acceptable and not acceptable to post online and to be a responsible global citizen. I feel that teaching them at an early age will help them to make smart and safe choices when they are presented with them. My students are building relationships with students all over the world. The world doesn't seem to be as big as it did before. As well as learning from each other, we are learning from other students and teachers in different cities, provinces and countries. 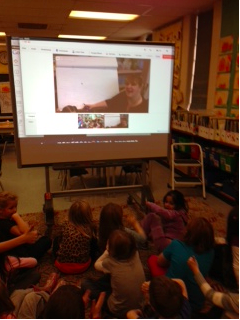 We had a lesson this week taught on Google Hangout by our "blogging buddies'" teacher, Mrs. Soltauheller in British Columbia about perspective. We have also talked with authors about books they we are currently reading in class. When the hurricane hit New York this past week, my students wanted to send out a tweet to their Twitter friends in New York to make sure they were okay. We are able to look at and post comments on class and student blogs all over the world. This past September, I started a blogging community with other primary teachers. We use Twitter and Edmodo to communicate with each other. We have been visiting each others' class blogs and will soon begin posting on student blogs. It has been a fantastic way to model the skills you need to post on blogs and create quality comments. If you are interested in participating in our next round. It begins in February. Please sign up here. If you have not jumped into the blogging world with your students, I whole heartedly encourage you to try it. You won't be disappointed! Love it! Hoping to start blogging this week with our students. Thanks so much for sharing. It sounds like you are far ahead with how to use the iPad effectively in a classroom...another thing I'm working on. I love this. I just started blogs with my students about two weeks ago. They are loving it. I have one student who hated writing time with a passion and would sometimes act out during it because he got frustrated so easily. When we started blogs, we came up with different ways we can write (cards, letters, stories, comics, etc.) He chose to write a comic book and he worked everyday for two weeks on it! We just uploaded this past week and it was such a great moment. He was so proud to get his first comment, too. The experience reenergized me, too. I teach a 1/2 class in Illinois, USA. 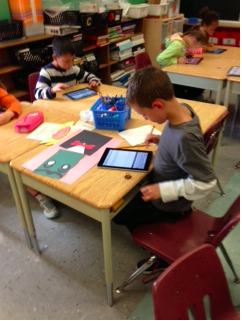 We only have four iPads in our room, but we're doing to our best to use them as much as we can. I look forward to reading more of your posts. 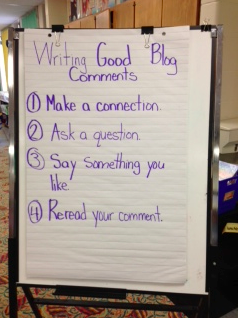 I'm going to teach my kids about commenting this week- thanks for the idea. Here is a link to my classroom blog, where you can find links to my students' blogs, if you are interested. I also just tried to sign up for the blogging community and it says view only. Can you help me? Thanks. I love working with you Mrs Wideen! Flexible, energetic, willing to help and try new things and I don't only have to chat when I want to - you are the perfect collaborator. Thank you for helping me push my comfort zones and leading the way to new learning! Those students are lucky to have you. You are all fantastic ladies! Karen and Sarah, you have shared your wealth of knowledge and your fantastic ideas with my students and myself. I am a better educator because of you both. I am so thankful to be connected with your! Sorry Erin, I just changed the setting so you can edit. We would love for you to join our blogging group! Amazing! I've started one central blog with four of my French classes on Weebly (I'm a rotating French teacher here in Ontario). I'd love to connect with your class and if you have any connections with other French teachers who'd like to partner up that would be amazing as well! You can reach me at www.mrera.weebly.com or at @monsieurera on Twitter. Wow! The bloggers are getting younger and younger and It's a great feeling that we're able to teach our kids the goodness and the benefit of blogging. Able to share their interests and get socially involved on some topics. Good job!